For many years now, some of the more creative work in the field of robotics has been driven by open source efforts. Open source robotics platforms have flourished, and they have mostly focused on humanoid robots of the type that Willow Garage and other organizations have specialized in. Over on the Kickstarter crowdsourced funding site, though, you can get a load of a brand new type of open source robot: Bartendro (shown here, image courtesy of Kickstarter). 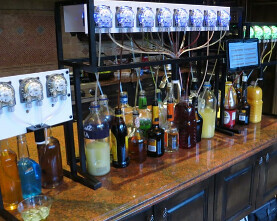 It's a modular, open source, cocktail-dispensing robot that has already reached its funding goal on Kickstarter with more than $190,000 contributed. And, it is powered by the Raspberry Pi.